The National Weather Service facebook page scroll down to find article. Harvey dumped so much rain along the coast that larger rivers rose higher than their normal watershed boundaries and began flowing into other watersheds that used to be part of the larger river meander system and oxbows. 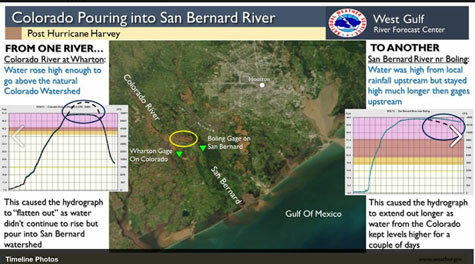 This image shows the lower Colorado invading the middle San Bernard - causing the Wharton gage (Colorado river) to flatten its crest while the Boling gage (San Bernard) gained additional water increasing its crest. 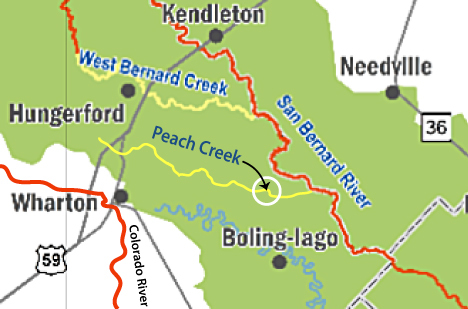 The National Weather Service (post Hurricane Harvey) said that the water rose high enough to go above the natural Colorado watershed and pour into the San Bernard watershed, flooding the West San Bernard and Peach Creeks. 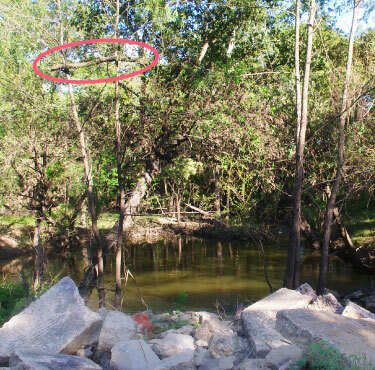 The photo is of Peach Creek north of Iago, close to the San Bernard River (white circle on map) Notice the log perched high in a tree (red circle) above the creek showing the height of the flood waters needed to lodge it there, approx 18-20 ft above the level of creek water now.